The position of John F Hunt Power Limited in the market place has grown steadily over the last few years, and can now count itself as one of the major suppliers of temporary power in the UK. John F Hunt Power recently acquired the freehold for the former Palmer and Harvey 3.5 acre site in Birtley to facilitate further growth in the North East. Ideally located adjacent to the A1M, the Birtley depot purchase follows on from the opening in 2017 of the Portbury depot in Bristol, which has seen tremendous growth in the last year. 2019 also heralds the opening of the Livingston depot which opened in January, marking John F Hunt’s first thrust into Scotland. Customers were quick to react to the new depot with the first generator delivered to a site in Glasgow within 24 hours of it’s opening. 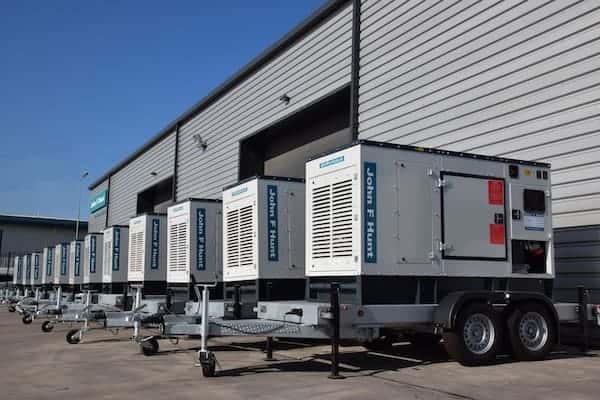 Backed by the might of the John F Hunt Group, Power is committed to spending £6m on new generators sourced from Italy and Japan, their emphasis being on super silenced and ultra-quiet units, emitting less than 55 decibels @ 7m. The growing fleet of high specification generators is expected to reach 2000 units by the end of 2019. John F Hunt Power was formed in 1998 to serve the Construction, Event & Utilities market, offering nationwide coverage for the hire, sale & installation of fuel efficient, environmentally sensitive diesel generators, Hybrid generators and LED Lighting Towers. The Grays and Halesowen depots also have exciting challenges ahead this year as their client base grows and the demands for Power services continue to increase. In order to cope with this expansion, Power have made a number of promotions to add another level of management to the business, and have also taken on new personnel, with more recruitment in the pipeline. John F Hunt Power have just been shortlisted for ‘Best Plant and Equipment Hire’ at the 2019 Festival Supplier Awards and have also sponsored the ‘Best Power’ category. Previous PostJohn F Hunt Power shortlisted for Supplier AwardsNext PostConcrete Cutting on the telly!